Gaindram Vishwakarma’s happiness knew no bounds when he received the Motorised Tricycke. 70-year-old Gaindram, a resident of village Baharpal, development block of Gariyaband district, has been given a motorised tricycle worth 35 thousand rupees for free by the government. On the basis of more than 80 percent disabilities, the Social Welfare Department has provided motorised cycle at no charge for Gaindram. Many people like Gaindram are being helped by the Chhattisgarh government with these initiative. The government is trying to ensure that no person is fully dependent on others because of disability. After giving a tricycle to Gaindram, he is also being taught the techniques of riding it. Interestingly, Gaindram knew how to ride motorized cycles, that's why as soon as he got the motorised tricycle, he started riding it. He did not look back and went straight from the collector's office to the bus stand. Many people who had come to the collector’s office kept calling him back. Since Gaindram had driven a normal tricycle, so he was able to drive the battery running cycle easily. 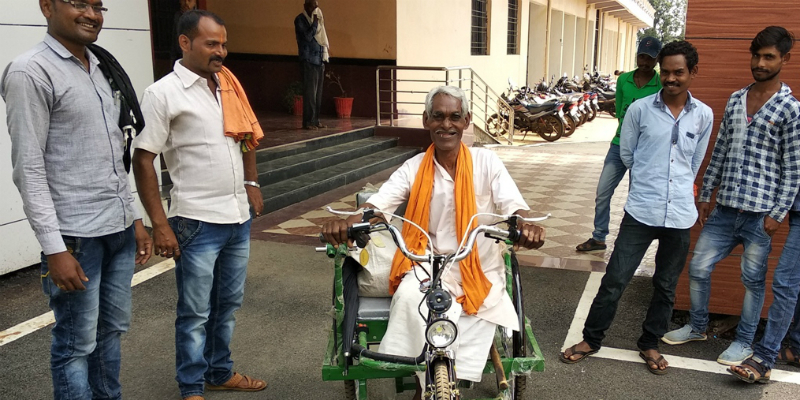 While expressing his happiness on receiving a battery run tricycle, Gaindram said that it was difficult to work on it initially, but now he doesn’t face any such issues. With the Motorised Tricycle he will also be able to travel longer distances. So far 4.33 lakh disabled authentications of Chhattisgarh have been completed by the Department of Social Welfare, out of which, the population of people with more than 40 percent disability is 02,84,464 and the population of people with more than 40 percent disability is 1,49,000. 66.67 thousand new digitised applications have been received by the department across the state, out of which 45,148 disabled people have the Unique Disability ID Card. Highest number of 38 thousand disabled authentications have been done in Raigad district, whereas in Durg district, most of the 08 thousand disabled people have got their Unique Disability ID Cards. The Chhattisgarh Government has extended the benefits of various housing schemes to 728 disabled people. On the basis of applications received from the year 2016-17 till now, 869 eligible beneficiaries have received accommodation. In the last three years, Raigad district has the highest 145, in Kanker district 91 and in Bemetra 67 disabled people have got the benefit of the housing scheme. Not only this, 10 kg food grains are being given to the disabled under the Mukhyamantri Khadyann Yojana. This scheme is in tune with the Section 24 (a) of the Disabled Person Rights Act 2016 by the State Government. Before this, 07 kg food grains were being made available at a rate of one rupee per kg to the disabled people. These schemes have brought happiness and prosperity to the disabled people of the state and they are now living a life of dignity without having to be dependent on others. The people like Gaindram are not stifled by their disability and are leading normal lives like other people. The Chhattisgarh government has been successful in bringing these people to the social mainstream with the help of these schemes.